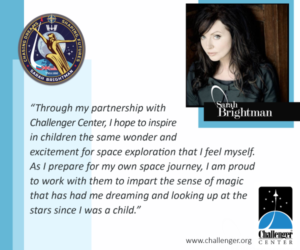 To celebrate my journey into space and recognise the combination of arts, science, technology, engineering and maths I have teamed up with the Challenger Center to launch a programme for students all around the world! The STEAM challenge will be launching in May so keep an eye out for more information. Here’s a video which will tell you a bit more about the challenge. You can also read more on the Challenger Center website here.